Although you have a right to choose where you want to deliver your baby, it is important to consider the potential dangers of home birth before deciding to go that route. While some home births are unassisted, certified nurse midwives and doulas often attend home births. They are usually well-equipped to handle uneventful home births, but not all births are uneventful. When complications arise, the home environment may not be suitable to manage unexpected emergency situations. A stillbirth is a term used to describe fetal death, after 20 weeks gestation, according to Centers for Disease Control. Although stillbirths occur in hospital delivery room settings, they are more likely to happen during a home birth. According to Weill Cornell Medical College, babies born at home may be 10 times as likely to be stillborn than those born in the hospital. It is unknown why certain stillbirths occur, but monitoring of fetal heart tones and other vital functions via the use of fetal monitors in a hospital setting may reveal treatable problems in utero. This means that if your physician determines that your baby's health is in danger, and if natural delivery is not imminent, you may be offered a cesarean section, which may prevent a stillbirth. Lack of supplemental oxygen in the home setting may be to blame for neurological deficits, but the causes of most home birth-induced neurological problems are poorly understood. When you deliver your baby at home, you do not have access to laboratory services that can reveal results of vital blood tests such as arterial blood gases. These tests can determine how well a patient's blood is being oxygenated, and if you or baby are found to be oxygen deprived, supplemental oxygen at the hospital may be beneficial enough to stave off neurological problems and seizures. If your baby gets his umbilical cord wrapped around his neck, he can become quickly deprived of oxygen, and this may contribute to seizures and neurological deficits. Home births are associated with increases in neonatal seizures and serious neurological dysfunction in comparison to hospital births, according to the American Journal of Obstetrics and Gynecology. A significant number of such complications or adverse reactions were related to hospital transfers from home births. According to the National Institutes of Health's PubMed.gov, home delivery is a significant risk factor in the development of post-partum hemorrhage. The risk for postpartum hemorrhage may be increased if you are taking certain medications such as prescription anticoagulants. The BMJ Journal states that pregnant women who receive anticoagulant therapy to prevent blood clots increase their risk of hemorrhage. There is little that can be done at home if you start to bleed uncontrollably before, during, or after delivery. Although your midwife may come equipped with medications to help manage bleeding as well as suturing equipment to repair tissue tears, they may not be enough to control brisk bleeding. An expeditious transport to the hospital may help stop the bleeding and preserve your health and that of your newborn. According to the American College of Obstetricians and Gynecologists (ACOG), having a prior cesarean section is an absolute contraindication for a home birth because of potential complications such as rupture of the uterus. Having a vaginal birth after a history of a cesarean birth may increase your risk of uterine rupture, according to the University of Maryland Medical Center. Unassisted home births are those not attended by medical personnel such as certified nurse midwives. They may, however, be attended by friends, family members, the woman's partner, or may simply be attended by the woman alone. Although you may anticipate the serenity of an unassisted home birth, it may be dangerous. According to Fit Pregnancy, an unassisted home birth may lead to quickly arising medical complications such as hemorrhaging and the baby getting a lack of oxygen. If you choose to give birth alone at home, you may be too weak or incapacitated to call for help, should delivery complications arise. Although perhaps not as dangerous as unattended home births, the assisted home birth is still not without risk and ACOG does not support or recommend planned home births. According to ACOG, the risk for assisted home births is further increased when they are attended by inadequate or poorly trained attendants. A poorly planned assisted home birth can result in disastrous complications, according to physician Aviva Romm, MD, a Yale-trained obstetrician. On her website, Dr. Romm points out that anyone can claim to be a midwife and states that "a poorly planned home birth or a less than competent midwife (or physician, though most home births are attended by midwives), in the rare event of a complication, can be disastrous." 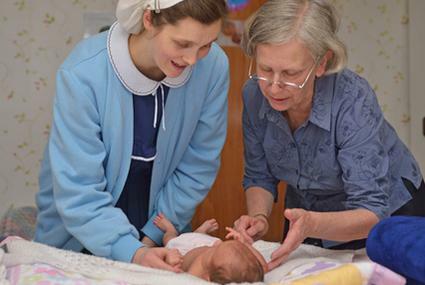 How long have you been a birth attendant? Where and when did you do your training? How many hours and births did your training involve? What skills and qualities can you offer? Would you consider attending a prenatal appointment with our midwife or obstetrician? Maternal and fetal safety need to be considered when parents choose home births. In certain cases, the dangers outweigh the benefits, so it is very important that you are thoroughly informed so that you can choose the right delivery option that best suits your needs and those of your newborn.